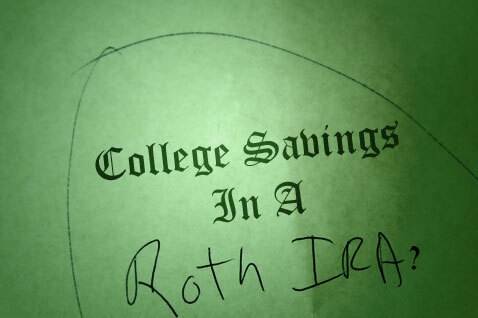 Should You Use A Roth IRA For College Savings? By Jason Topp 7 Comments - The content of this website often contains affiliate links and I may be compensated if you buy through those links (at no cost to you!). Learn more about how we make money. Last edited October 24, 2014 . We are coming up on graduation season and the focus on college will be starting soon. There is a lot of confusion about which college savings plans are the best to save for college. Most of us have heard of 529 plans, and there are advantages and disadvantages to using 529 College Savings plans for college, but have you thought about using your Roth IRA for college funding? Let's check out the positives and negatives. If you decide you should open a Roth IRA and would like to use it for college savings, but you will be taking the money before you turn 59 1/2, the 10% penalty for early withdrawals is waived. Of course, this is provided you are using the money for college education expenses. The same goes for withdrawing from Traditional IRAs as well. Remember, you can always pull contributions out of your Roth IRA at any time without tax or penalty because it's after-tax money. Normally if you pull earnings out of your Roth IRA early there is a 10% penalty applied to those withdrawals – so that is waived. Financial Aid is a big part of college funding, but the government does not count the Roth IRA values when you are applying for financial aid. This is huge for those hoping to get some money from financial aid and are worried about shooting themselves in the foot because they've saved some money. One of the big detractors for 529 plans is that if your child doesn't go to school and let's say you don't have another who will go to college, then all of the earnings in your 529 plan are taxable and distributions are also penalized with a 10% penalty! With the Roth IRA; however, you don't have to worry whether your child wants to go to college or would rather move to L.A. and start a rock band after graduation. Your money will still be in your name and will be used for your own retirement! Roth IRA rules state that you can withdraw your contributions at any time without tax or penalty. Any earnings however, must have been in the account for at least 5 years and if used for higher education they are still taxable. The 10% penalty for early distribution are waived, but the taxes are still owed. “The entire IRA distribution, taxable or not, must be included in base-year income on the student's federal financial-aid application for the following year” according to Joseph Hurley, CPA for Bankrate.com. This can reduce your needs-based financial aid package. You can only put in the max of $5,500 per year to the Roth IRA ($6,500 if over age 50) provided you have at least $5,500 of earned income. With a 529 your contributions are essentially unlimited. The last big trade off is the fact that you will be using your own retirement nest egg for your child's college savings. Unless you know how much you need to retire and are sure that using your Roth IRA for college won't impact your retirement picture, then you may want to think twice. What are Your Thoughts – Are Roth IRAs Good Ideas for College Savings? Tell us your thoughts in the comments. Last Edited: 24th October 2014 The content of biblemoneymatters.com is for general information purposes only and does not constitute professional advice. Visitors to biblemoneymatters.com should not act upon the content or information without first seeking appropriate professional advice. In accordance with the latest FTC guidelines, we declare that we have a financial relationship with every company mentioned on this site. This is one of my favorite strategies! Glad to see that it is becoming more prominent. One benefit of choosing the Roth IRA that you didn’t mention is the greater breadth of investment options. Investment alternatives are generally quite limited in a 529 plan and some of them are not performing well. With a Roth IRA, you have complete flexibility to choose your assets and adjust your allocation as time passes. Great point Kristin! Thanks for bringing that up!! We decided to use the Roth for our 2nd child instead of opening another 529 like we had done with our first, primarily for the reasons Kristin mentioned about having more options. Additionally, I’ve been looking for additional guidance on utilizing my Roth-401K as a potential education funding source. I can’t find any articles discussing this as a strategy, but you have much higher contribution limits with the Roth-401K. 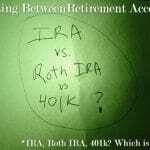 I’m assuming that even if there were restrictions on the Roth-401K, that I will probably be in a situation 15 years from now that I could rollover the Roth-401K to my existing Roth IRA. Then I would be able treat college expenses under the standard Roth IRA guidelines you outlined. One thing that is not mentioned here is that some states provide tax incentives for contributing to a state-run 529 if you are a resident of that state. If you live in such a state, this is another trade-off to consider. We recently moved to Colorado which does not offer such state tax incentives. I was considering using my Roth IRA for both of our children’s college savings, but the fact that earnings are taxable out of the IRA is a big turn-off. That is true, some states will offer a tax incentive for contributing to the state run 529. My state doesn’t. If your state doesn’t have an advantage to their plan, and you like another state’s plan better, you can always invest in the other state’s plan. Stumbled on this while having a back-and-forth conversation online about IRAs as college funding sources. Thanks for laying out the debate clearly. I think each person’s circumstance is going to dictate whether this is potentially viable for them, but ideally folks will be pouring so much into tax-advantaged retirement accounts that they won’t have room to squeeze their IRAs for the kiddos. We personally use an UTMA because we understand that many jobs in today’s environment don’t require a billion years of school. It’s likely that at least one of our brood will choose to work in fields requiring on the job training, or other non traditional education. Plus, with scholarships and a parental expectation that those cuties will work to help pay for school. It’s our hope that we’ll get to hand over a wad of cash and say, “here, go do something amazing!” Again, I understand that each family’s circumstances are different. Thanks again for the article. Previous Post: Where Is All My Money Going?!? !